We have an empty bed at the front of the house. (Well it's almost empty, there are a couple of self sown plants - a California poppy and a foxglove - growing there at the moment). As you can see from the photos it is an irregular shape but measures 3m at it's longest and just less than 3m at its widest. 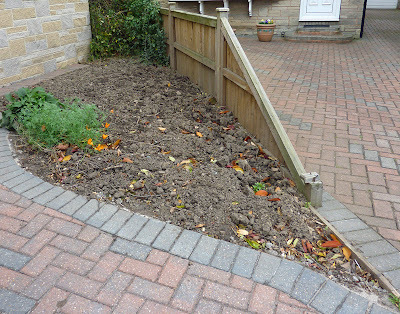 We want to plant up the bed so that it is colourful for as much of the year as possible with perennial plants and bulbs. Bulbs for spring colour and the perennials for summer and autumn to give a sort of cottage garden feel. No doubt I'll pop in a few annuals to fill gaps etc at least until the perennials bulk up. A bit of winter colour can be provided by a couple of tubs by the door etc. We don't want to grow shrubby plants although we would like to grow something up the fence that our neighbour erected as this doesn't look good from our front window. The fence is about a metre high. 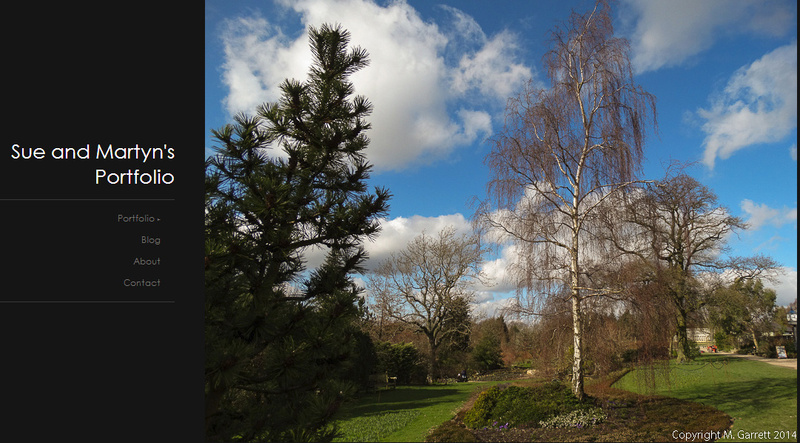 The plants sprawling along part of it at the moment are a winter jasmine and a quince. I've been searching for ideas for plants that have a long flowering season and have come up with penstemons, hardy geraniums, salvia, verbena and maybe the shorter Michaelmas daisies. Just wondered if any of you had any suggestion for plants that reliably flower for a long time or really good ideas for what to grow up the fence. New strawberries for next year? 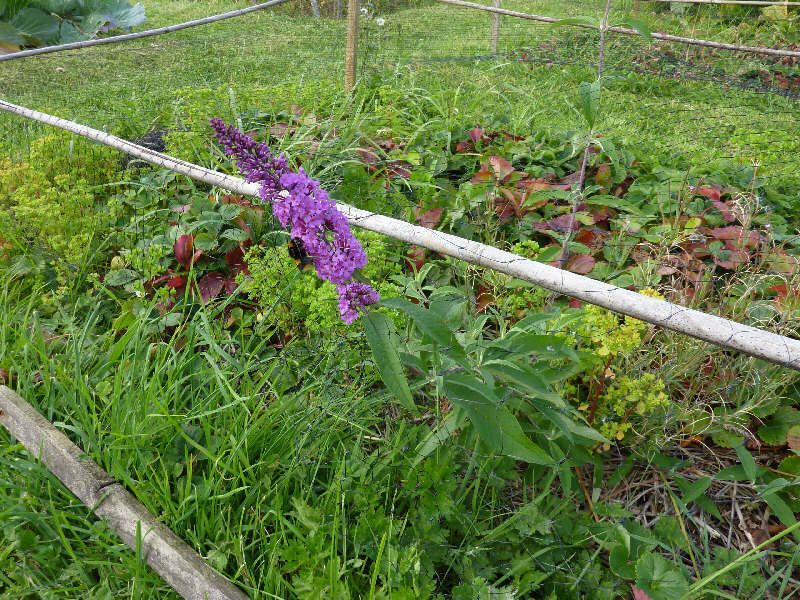 The main activity on the plot at the moment is tidying and clearing. One area - the strawberry beds was in desperate need of tidying although you really need to see what the beds were like before my efforts at tidying up to appreciate how much better they look so here is the 'before' photograph complete with a self sown buddleia plant. 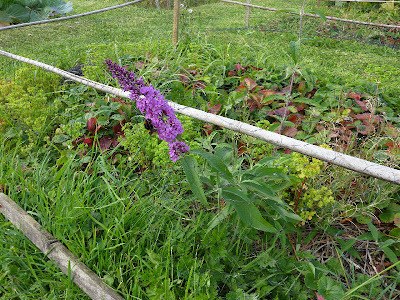 You may still be able to spot the buddleia in the second bed - I haven't decided what to do with it yet. The new bed will be prepared over winter and the old beds kept going next year until the new plants are producing well. At the moment the 'new strawberry bed' looks like this. The existing strawberry beds have been in place for over three years and so we thought it was time to create a new bed. We have ordered four varieties, Marshmello (which we know is good main variety), Marshmarvel (a new early variety), Amelia (a late variety) and Finesse (a new everbearing variety). These along with our alpines should give us a long picking season. We have sown new alpine strawberry seeds this year - we grow new plants every year -and the young plants are growing on in a nursery bed. We have found that alpine's need replacing fairly regularly and they are easily grown from seed - in fact some of the newly grown plants have already produced one or two berries and there are also a few self sown seedlings amongst this years plants. The variety is Mignonette which seems to be the easiest variety to find. The alpines were still flowering up to this weekend but I guess the frost (yes it has reached us now!) of Sunday night has blackened the flowers and put paid to any more fruits. We could have propagated Marshmello from runners taken from our old strawberry plants but we made the mistake of growing different varieties too close together and consequently it is difficult to tell which variety the runners have come from. We’ll be more careful in future but it is a good to buy new stock from time to time. (Click here for more information on how we propagate and grow our strawberries). Would it harbour more slugs? How do I feed the plants? Does the soil become sour? As you can see lots of doubts so it's likely that it will be back to straw unless anyone has another idea about a suitable mulch! Can't blame the weather this week! 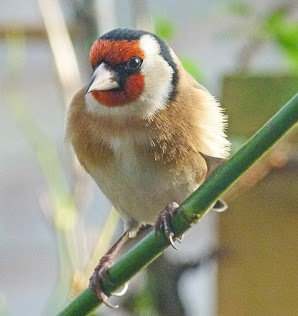 Only one visit to the plot this week - can’t blame the weather though as it has been fine and dry for most of the week. We have been having lots of work done at home including replacing all our windows so although we didn’t do much gardening we were very grateful for the dry, still and not too cold weather. We did manage a plot visit to do a bit of weeding and digging up some of the remaining Sarpo Mira potatoes - fortunately not all were housing the 'snakes' mentioned in the last post. 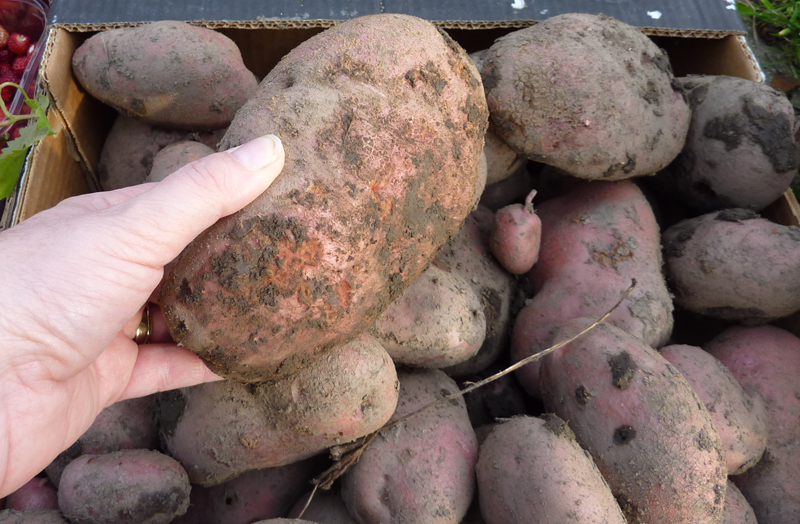 As expected some tubers were fairly large. 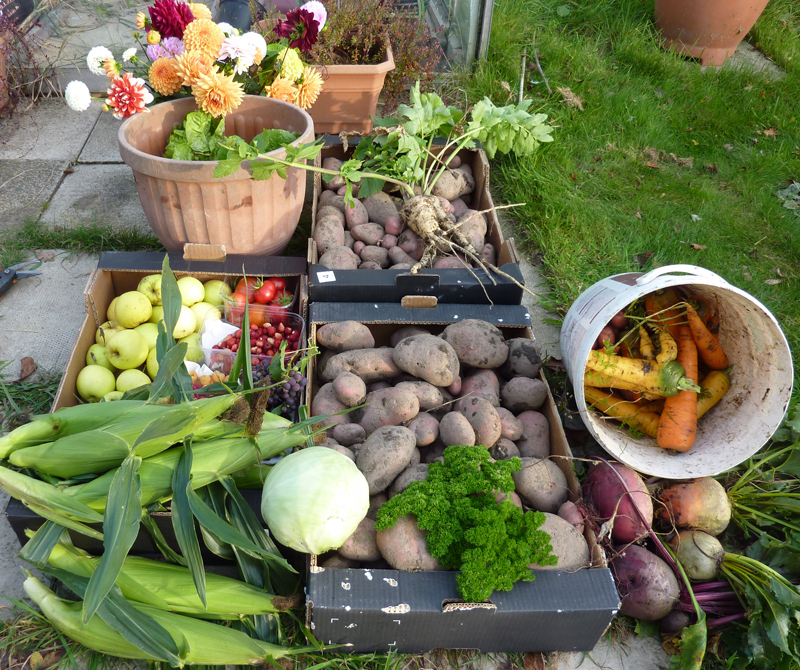 As usual harvesting was our first priority. We had some bonus pickings including quite a few apples that we had missed and even a few strawberries to add to the alpine strawberries and autumn fruiting raspberries. 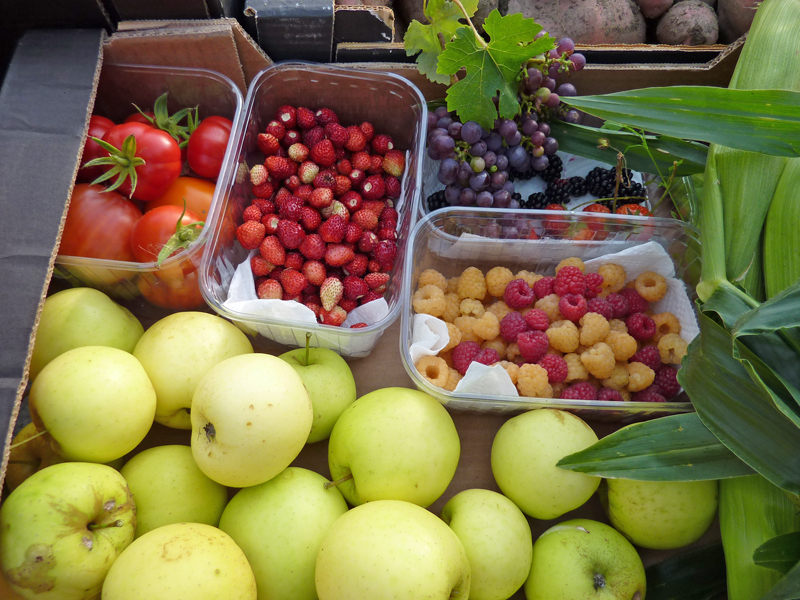 No doubt the frosts will soon descend and put an end to the fruit and flowers﻿ so we will have to enjoy them while we can! 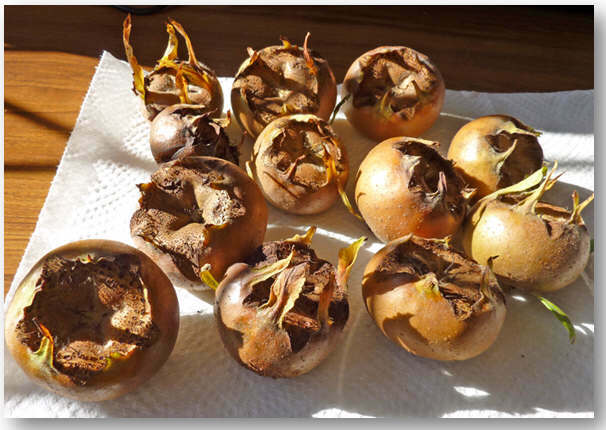 We have also picked the medlars from the tree in the garden which are now bletting in a spare room. We really chose the tree more for it's ornamental value - which is why it is in the garden - so any fruit from it is a bonus. If you are interested I have a page on my website which has lots of information about our medlars and how we used them last year. Click here if you want to read it. last week is here on my website. By the way so far the pansies are nibbleless! I've always been envious of people who have seen snakes on their plot but I hope I don't see many more of these little devils! I wanted to plant up the containers in the garden so we would have a bit of colour over winter and early spring so I visited a local nursery. They always have a good display of pansies at this time of year and I wasn't disappointed. 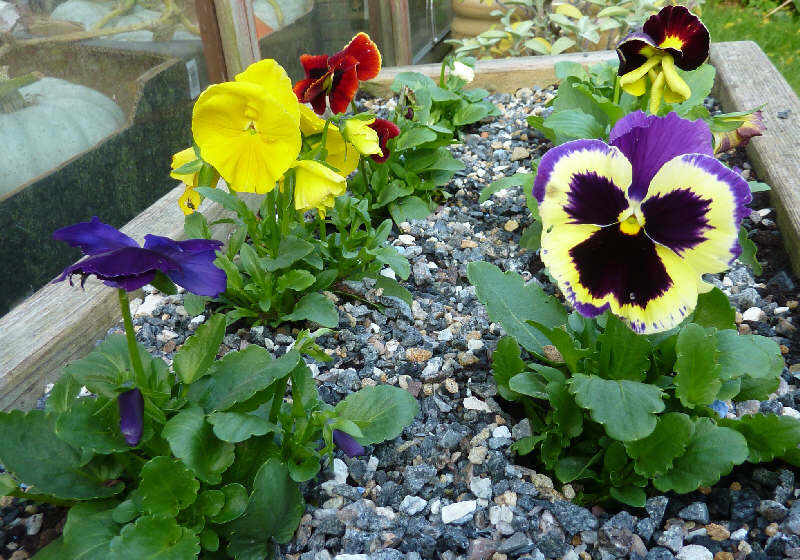 The good thing about this nursery is that the pansies are a good size and planted in individual pots which means that you can choose exactly which plants you want and get a good colour range. 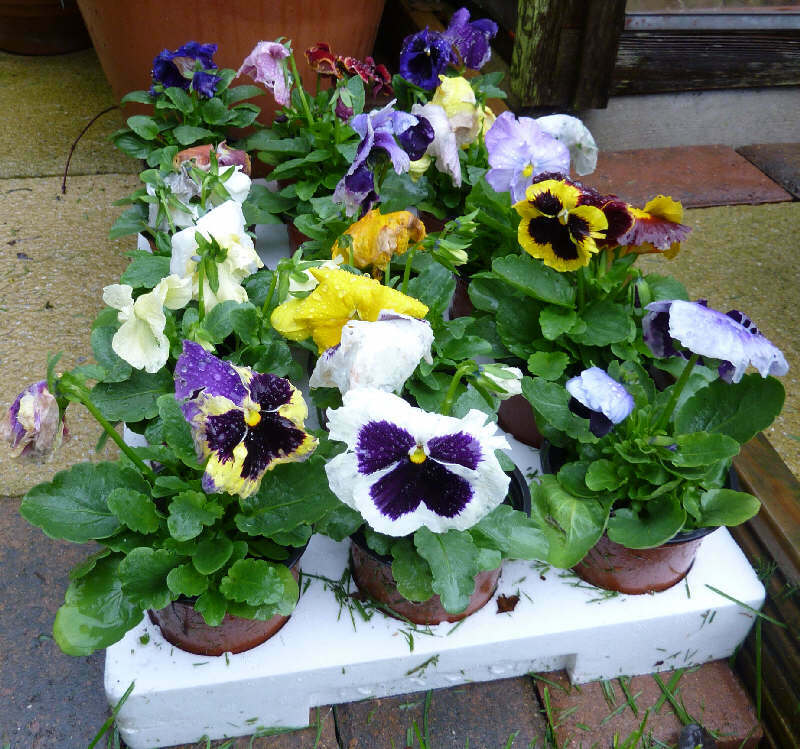 Often pansies are sold in a mixed tray and you just have to buy a tray regardless of whether most of the flowers are the same colour. 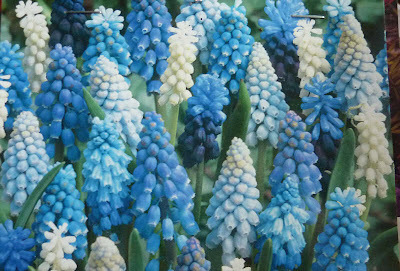 I also bought some muscari or grape hyacinth bulbs to plant amongst them. The pansies and bulbs had to wait patiently for a suitable planting day which arrived last week. After clearing the containers of nemesia﻿ and scrapping off some of the old compost and topping up with new I set to planting. Last year the pansies were badly nibbled by slugs so I am trying to give them some protection this year. 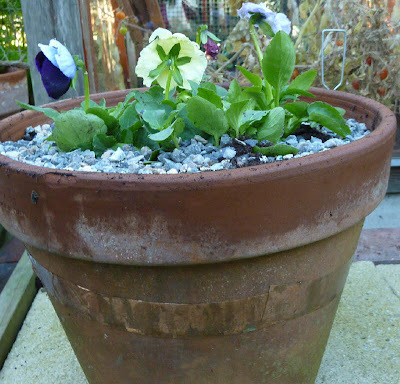 Firstly I have wrapped some copper tape around the terracotta pots. I know that some people say that this doesn't deter slugs but we have seen them avoiding it so it must help. The tape wasn't really suitable for our wooden trough though. Last year we bought some granite granules which is supposed to be a natural deterrent. We never got round to using them so I put some of these on top of the compost as a mulch. It looks quite decorative. My sister is trying a novel way of protecting the pansies in her containers - she's mulched with poodle wool. Fortunately this is black and so doesn't stand out. I guess any type of measure won't be foolproof as slugs are determined creatures but you still have to try don't you? We found the moat method that we used in the cold frame to be successfiul for trays of seedlings and young plants but this would look a bit silly used on containers in the garden. 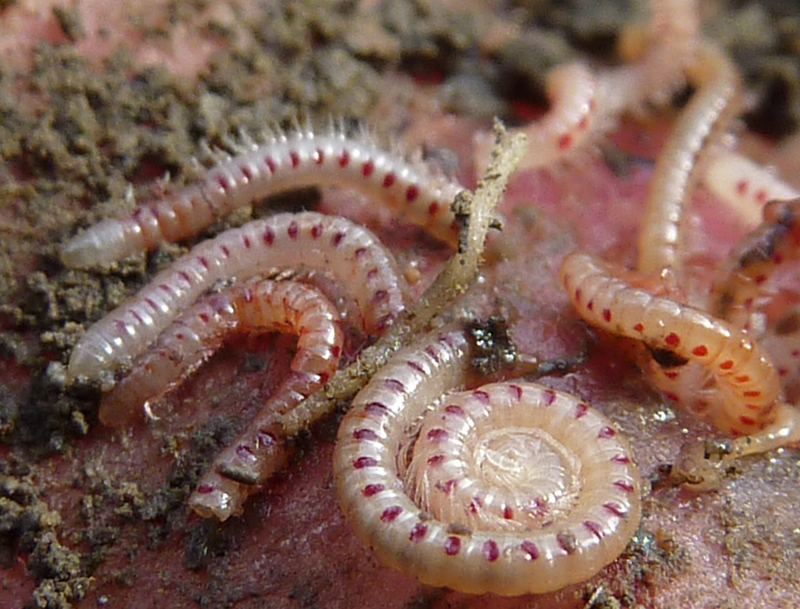 So have you found any slug-wars methods that work really well? My October diary has been started here if you are interested. 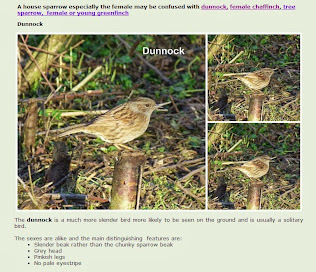 We have also set up a new weather diary here which contains some of the information from Martyn's weather blog. "From the M6 theatre company, through a visually delightful set, original music and strong emotional journey, the children can rediscover - that surprises are more enjoyable and disappointments more bearable, when shared with a friend.” It is the story of "an unlikely friendship on the fertile ground of an allotment - a place where the patchwork and diversity of people and plants grow side by side". We don't keep chickens but I know many of you do so you may be interested in a new website that is currently under construction. If you keep chickens this site offers a new online community designed for people like you - to share your tips on raising backyard chickens from choosing the poultry house, chicken coop or luxury hen house to choosing the poultry equipment and supplies and more importantly it's a place just to meet others. 4. You can bookmark your own web page for family and friends and the world to see! 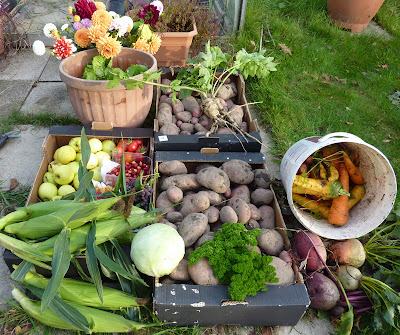 It's been a case of dodging showers to visit the plot and harvest a few things this week. We even managed a few peas! You may also be able to spot the three quinces that had fallen from the tree. I don't think that they are quite ripe yet. With all the wet weather we thought we'd better harvest our squash. This year we grew Crown Prince - this is a favourite and has grown successfully for a few years now - and Potimarron which is sometimes classed as a pumpkin and in other places referred to as a squash. What's the difference - anyone know? We haven't grown this one before so don't know what it tastes like. A tip I found somewhere that seems to work is to cut a section of the vine away with the fruit rather to produce a sort of handle. This is supposed to help prevent the fruit from rotting in storage - and it seems to work. We also harvested all of our peppers from the garden greenhouse﻿ - this year having had only limited success with bell peppers we decided on the pointed varieties - Jimmy Nardello and Tequila Sunrise. 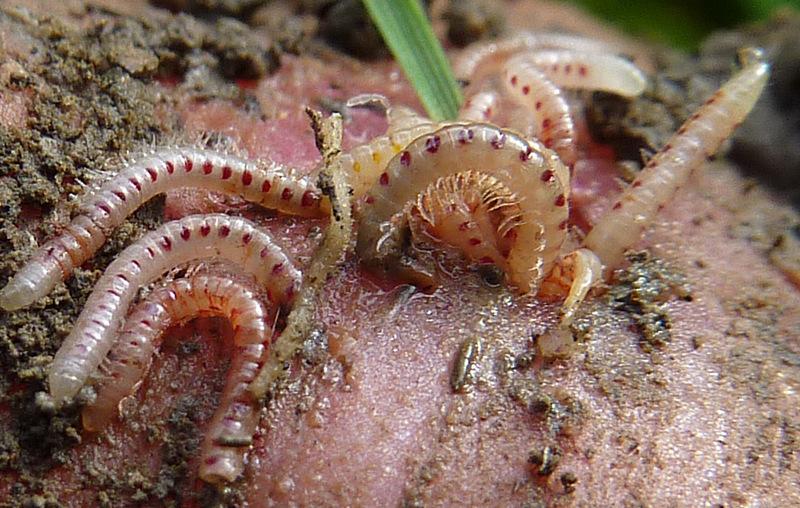 Must admit to being a little worried that they looked a bit like chillies. After last year chillies and I just don't feature in the same place at the same time! Anyway no need to have worried as the peppers are indeed sweet peppers with no hint of chilli about them. As for carrots - I think the carrot fairy has paid us a visit this year! Most of our carrots have been of a good size but the latest lot of Autumn King have been whoppers! The largest carrot weighed in at 650g and was perfect, no splitting, no carrot fly damage, no woody core - it tasted just as delicious as the small ones do and gave us two large helpings all by itself. I've posted my full diary entry for the last week in September here if anyone is interested in reading more and more photos are posted here. There's also a video clip of our plot here.